Wouldn't it be nice to have individual and overview dashboards that were actually useful, and not just something that is glanced at before carrying on work? We run support desks too, and having our KPIs on wall screens around our offices, with stats of the day and week that are relevant to our service level promises, is invaluable. Having a live feed of updates as they come in from our end-users, means we know what is happening, when it is happening. Keeping up-to-date as the day progresses means that efficiency is high, and costs are kept low. We have many dashboards in NetHelpDesk, useful for many different reasons, such as time capture, overseeing work in detail. Tell us what you need from a dashboard too! View the date and time in clear display, to keep track. See target timesheet hours, against actual recorded time. View how many tickets you've opened and closed personally. 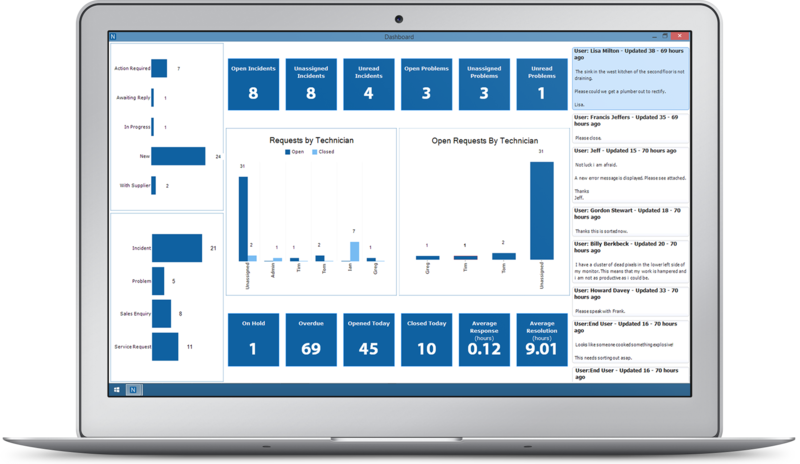 See your requests in request type order, all ITIL aligned. Visibility of statuses across all calls to track work. Live data feed of updates as they happen on calls. Key Performance Indicator statistics for individual perfomance. 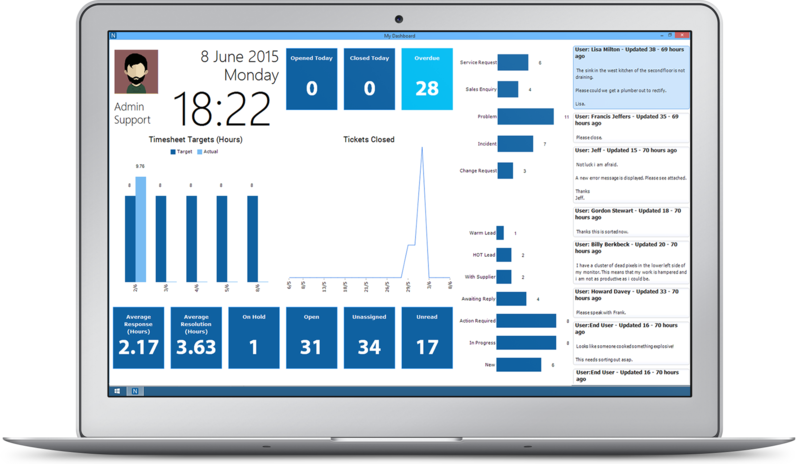 Oversee the performance of your team in one screen. See requests open and closed per Agent login. Visibility of open requests by Agent in easy view. Project dashboad onto TV screens around the office. See requests broken out by request type, all ITIL aligned. Visibility of statuses on all calls to see where team is. Key Performance Indicator stastics for group perfomance. Whilst we have create dashboards that we think are useful, and certainly a good portion of our customer base does as well, there is always room for improvement. The best thing for us here at NetHelpDesk, is that every company we speak with are like snowflakes; completely unique. We don't want you to change for us, but we are happy for you to change for you. Over the years, we have produced specific, bespoke dashboards for some of the biggest names in their industry. What they need from a dashboard may differ from yours, or be very similar, but with a few tweaks. Speak with our team about your requirements for dashboards when you buy NetHelpDesk, and we'll make dashboards that will answer your dreams, and all as part of our service to you. The best thing for you, as that we can probably do this for you as a part of your purchase of the product, at no extra cost.